1860 – It was before the start of the Civil War; Lincoln would be elected in November. 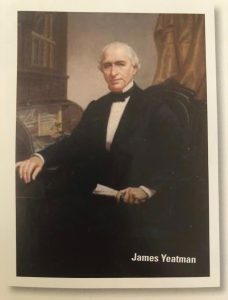 James Yeatman, a banker from Tennessee, had recently moved to the City of St. Louis and noticed the homeless and hungry on the sidewalks. He and several business leaders founded Provident to help those in need. The agency flourished, providing services to the most vulnerable in the community. Three prominent organizations had their start at Provident and eventually spun off as separate institutions: the Visiting Nurses Association (1895), the George Warren Brown School of Social Work at Washington University (originally founded as The School of Social Economy in 1903), and the Urban League of Metropolitan St. Louis (1919). The agency continued to evolve and expand to its present mission – building brighter futures through exceptional behavioral health services, especially for those with the greatest need. We became known as Provident Behavioral Health in April 2019.